You read an article and agree with the author’s argument. Scrolling down you read the comments and connect with one that presents various logical holes in the article. Ideas you had not previously considered change your perspective. Did a human influence your thinking? The quickening pace of advancing technology is making the noticeable difference between humans and Internet bots more indiscernible and will continue to do so to greater and greater degrees as technology continues to progress. The Internet Research Agency (IRA) is a Russian company located in St. Petersburg that has engaged in political influence operations propagating perspectives online to influence international opinions. Examples of targeted influence operations include the 2016 U.S. Presidential Election, U.K. Brexit Referendum, and 2017 French Presidential Election. Employees were given lists of topics where three employees would work together on a single news item, coordinating their posts to give the illusion of discussion or debate and “to make it look like we were not trolls but real people. One of the three trolls would write something negative about the news, the other two would respond, ‘You are wrong,’ and post links and such. And the negative one would eventually act convinced.” Documents describe that the IRA expected employees to manage 10 Twitter accounts that obtained at least 2,000 followers and tweeted at least 50 times a day. Twitter has reported over 50,000 accounts linked to Russia were used to tweet automated material about the 2016 U.S. election. Initial reports claimed that 677,775 Americans interacted with these accounts, but this figure has been increased to 1.4 million people unsuspectingly interacting with accounts associated with Russian proxies. Twitter announced it had identified 3,813 accounts associated with the IRA that had posted 175,993 tweets during the U.S. Presidential Election campaign. Individuals posing as Americans or citizens of other targeted states influenced public opinion by working to sculpt an individual’s viewpoint in line with Kremlin perspectives towards specific events. Networks of automated Internet bots, short for software robots running tasks online, operated with a similar objective – influencing, shaping, and changing opinions in line with the Kremlin. Social bots are a subcategory of Internet bots and include accounts controlled by software using algorithms to generate content and communicate with human accounts. Not all bots are malicious, and some serve useful purposes spreading news, coordinating volunteer activities, and assisting volunteers to edit Wikipedia pages, for example. The malicious use of bots has increased in recent years to “manufacture fake grassroots political support […] promote terrorist propaganda and recruitment […] manipulate the stock market […] and disseminate rumours of conspiracy theories.” Noticeably, it is already becoming difficult to tell the difference between human and bot activity online and the distinction between the two will only become more indiscernible with further technological advancements, such as the application of artificial intelligence and deep learning to automated online communications. One major feature of the problem is that it has been shown to work to manipulate “public opinion, choke off debate, and muddy political issues” specifically targeting “sensitive political movements when public opinion is polarized.” For political campaigns the use of political bots “have become an acceptable tool of campaigners,” according to Woolley and Guilbeault. Future research must aim to understand modern political influence operations basing policy developments both on what technologies were applied and how advancing technologies will be incorporated into future operations. In order to combat future operations, in which discerning fact from fiction may become nearly impossible, governments and information-providers must strengthen press freedoms, independent fact checking, and anti-disinformation institutions within civil society. Fighting propaganda with counter propaganda must be avoided as it only intensifies the informational security dilemma. 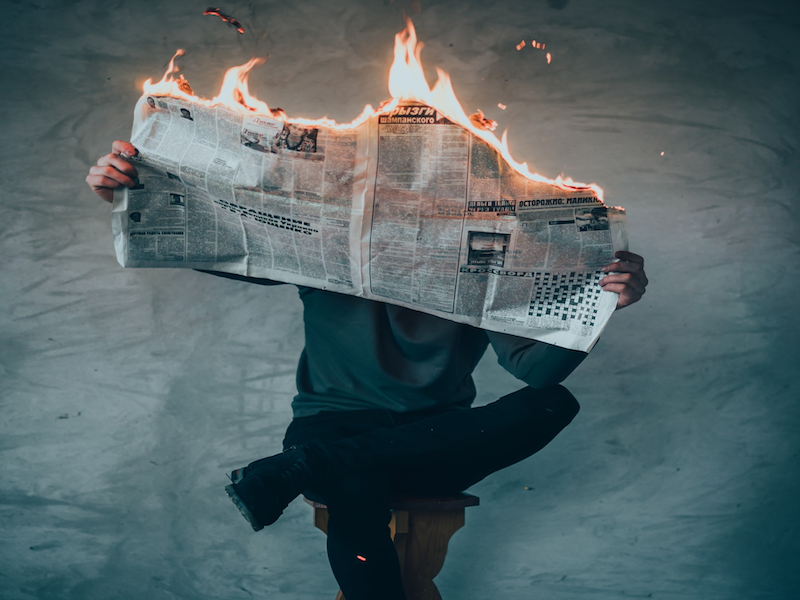 Featured Image: Calm Man is Reading Fire Newspaper | March 22, 2018 By Elijah O’Donell on Unsplash.